4 Guardians painted with help from a ton of people, including 357, Bam, Vogue TDK. pleased to present our mural concept. This is our interpretation of the four Chinese celestial creatures. They are from left to right: Qilin (Kirin/unicorn), Fenghuang (phoenix), Dragon and Tortoise. Our goal here was for the larger shapes to be easily identifiable from the highway, and if people walk up to the wall, then they will see the details in each one. We have incorporated elements from contemporary hip-hop art forms within the body of each creature with the intention of connecting the younger generation with the old myths, culture, and ways. Within the creatures can be seen arrows, turntables, spray cans, and adidas shoes. Here is the traditional meaning behind each creature. Many pardons if we have butchered this! It ate fire in its ravenous fury, but it was specially praised for being able to discriminate between good and evil, and that it would gore the wicked whenever it meets them. Appearing only when there was a wise and virtuous ruler, and that it had a discriminating mind that it enabled it to know when benevolent rulers or wise sages would appear in the world. It was considered to be able to walk on water, and that it had a perfect goodwill, gentleness, and benevolence to all living creatures. It is so gentle that when it walks it is careful not to tread on the tiniest living creature and will not even eat live grass but only what is dead. The span of this animal's natural life is a thousand years. In Chinese mythology, the Qilin was an animal of good omen that came to humans only on important missions. In Chinese mythology, the phoenix is the symbol of high virtue and grace, of power and prosperity. It represents the union of yin and yang. It was thought to be a gentle creature, alighting so gently that it crushed nothing, and eating only dewdrops. It symbolized the Empress usually in a pairing with a dragon (the dragon representing the Emperor), and only Empress could wear the phoenix symbol. The phoenix represented power sent from the heavens to the Empress. If a phoenix was used to decorate a house it symbolized that loyalty and honesty was in the people that lived there. Jewelry with the phoenix design showed that the wearer was a person of high moral values, and so the phoenix could only be worn by people of great importance. The Chinese New Year Dragon is the emblem of guardianship and vigilance. The Chinese dragon has long been a potent symbol of auspicious power in folklore and art. The Dragon is a beneficent and gracious creature and is worshipped as the divine ruler of Lakes, Rivers and Seas. It is the powerful yet gentle 'Loong" that brings rain to the earth, hasten the crops and cools the toiling framer. The Chinese dragon is traditionally also the embodiment of the concept of yang (male) and associated with the weather as the bringer of rain and water in an agriculturally water-driven nation. Its female counterpart is the Fenghuang. The tortoise represents longevity, of steadfast effort, of deliberate action that inevitably leads to success. The combination of the Dragon and Tortoise combines the qualities of both animals into a potent symbol of success and longevity. Dragon Tortoise symbolizes good fortune and longevity. I know the first three are a Qilin, Phoenix, and a dragon, but what is the last one called? Thanks. Just trying is all. Ooh, that's in Oakland? Where? I must go see it. It's facing the tracks. Enter the gate in the fence of the parking lot next to East Bay Asian Youth Center. It's at E. 12th St at 20th Ave. I have another wall next to it on EBAYC. Both murals face towards the bay. Wow, it's actually visible from google maps street view. XD But I think I'll still go see it in person one of these days. Now that is some serious street art! I wish there was more of this on our walls where I live rather than the lame attempts of some punks. Any who fantastic illustration style and great use of colors. This is just completely freehand? no use of stencils? did you use organic wheat paste or the old school paint can? also how long did it take to do this painting? sorry to ask so many questions but it's just super cool! Thank you. Yes, no stencils, all freehand, all spray paint. I think it took us a month using ladders. Would have been much faster with a boom lift. byakko, suzaku, seriyuu and genbu?? this is marvelous work, bravo! Wow, thanks! I'm not Chinese, but I tried to paint it proper. I love the detailing. Very Beautiful. Are these of the 9 dragon sons? I can never remember the names of the tiger and the turtle! Or is it tortoise? 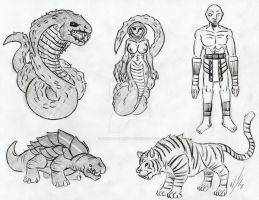 The tortoise is called Genbu, and the tiger is called Byakko. At least from what I remember that is what they are called. It has been a few years since I first learned this, so my memory is kinda iffy. No problem. Though i believe if you look online there are tons of different names for them. Those 2 are the only ones I know by name. Wow...You did a really great job. I imagine it took a long to to complete. Yeah the dragon alone took 10 days.